At PeachTree Place Assisted Living Community in West Haven, we provide your loved one with the warmth of home during the holidays with our holiday celebrations. We know just how important social activities with family, staff and other residents are and strive to create a variety of fun celebrations commemorating the season. We deck the halls with all the favorite yuletide decorations for this very special holiday and provide food and treats for residents and guests alike. A beautiful Christmas tree is the centerpiece of the festivity, reminding your loved one of cherished memories of past celebrations. 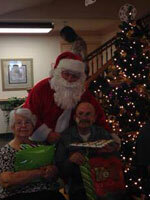 One of the highlights of the celebration is a visit by Santa Claus himself, always a favorite of our residents. 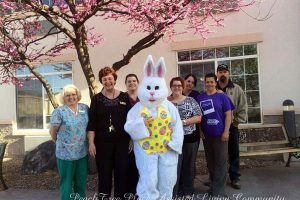 To enhance the experience, you can bring family photos, Christmas presents, and favorite Christmas cookies and candies to enjoy and share with other residents, visitors and staff. You can also join in caroling or provide additional decorations for your loved one’s room to promote the holiday spirit. 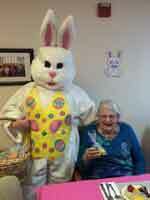 Easter dinner and a visit by the Easter bunny bring fun and excitement for our residents and guests. Enhance your loved one’s enjoyment of this traditional holiday by arriving with an Easter basket filled with their favorite candies to remind them of childhood memories. Let them share their treasures with others to spread the joy. 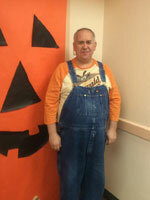 Ghosts and goblins abound as we decorate the entire center for this fun-filled holiday. Residents and guests alike are encouraged to sport their favorite Halloween costumes and trick or treating is not out of the question. 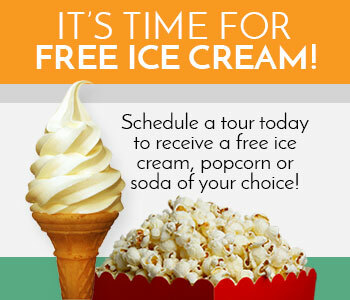 Be sure to join in the festivities and perhaps bring Halloween candies for your loved one to enjoy and share. The traditional Thanksgiving feast with all the trimmings is served on this very special family holiday. The center will be decorated for autumn and harvest time to create a warm and inviting atmosphere. Join us for at least part of the day to help your loved one recall the closeness of family gatherings and establish a new tradition to be shared in their new home and community. We provide decorations and activities to celebrate all of the major holidays and give our residents a varied and stimulating atmosphere. Connecting with other residents, families and staff will greatly assist both yourself and your loved one in feeling like he or she is part of the community. Also, including other residents who are alone during the holidays can brighten everyone’s day and promote new friendships. While it is sometimes difficult to balance time spent with family at home against time spent with family in an assisted living facility, it means so much for you to spend at least a few hours during the holidays making your loved one feel cared for. When you return home, you can rest assured that they are in capable hands here at PeachTree Place Assisted Living Community. Contact us at PeachTree Place Assisted Living Community to discover all the ways we encourage engagement and foster celebration.